Normally I'd try to go into the New Year hopeful for the upcoming year. Unfortunately, I don't think I can force myself to be positive this time around. Apologies if that's what you've come to expect from me. Upbeat and optimistic - really can't pretend to be that for anyone right now. 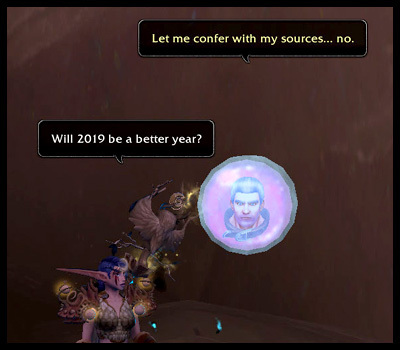 2018 was miserable for me personally and IRL (and it still is, even on the eve of 2019), and I have to admit it was pretty discouraging in terms of pet collecting. I'm definitely grateful for all of the new pets implemented; lots of fun and interesting ones to collect. But the negatives outweighed the positives in BFA, so it was difficult, and often impossible, to ignore or overlook the frustrations of collecting. To be completely frank, it feels as if BFA has killed my desire to pet collect. I think it's a lot of little unfavorable factors in this expansion compounded onto each other that's led to this feeling. Mainly the loss of player agency, the ever-moving goalpost being pushed so far out that you're not even sure where to aim anymore, and the overwhelming sense that it doesn't actually have to be this way... but it is. Because money and the game-ifying of gamers. I won't speculate how things are run or why certain decisions are made. Let's just say that I don't agree with a lot of the design choices in BFA so far. This is just my two cents, but instead of enticing and keeping many in the game, it's actually pushed many away. Many collectors have simply quit. Some have continued to stick it out. BFA is not an overwhelming success story in regards to satisfying collectors, in my opinion. It wasn't all bad though. 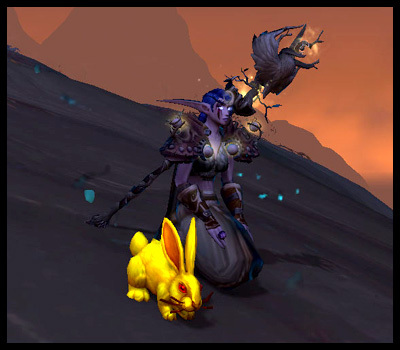 BFA was the second largest influx of battle pets at the release of an expansion, coming in behind only MoP. Some pets had some interesting stories, while others felt engaging enough despite being tedious or annoying to collect. My desire to create content for my blog has dwindled, unfortunately. Maybe my enthusiasm has waned? Time has been an issue, and a lot of the time I'm basically writing duplicate things for WarcraftPets and my pet collecting blog. So there's also that. I don't blame this on BFA though. My slowdown probably started in Legion, although it wasn't as bad as it is now. If you followed for content, apologies. All I can recommend is to keep up with WarcraftPets for pretty much the same content, with less of a personal touch. I still have opinions about all things battle pet and Pet Battle related. Less of a desire to share or explain them though. Feels like a lot of it just falls on deaf ears, and much of it are thoughts and opinions that I've held for years. And I still enjoy my little companion friends, and I have a handful that I especially like to have at my side while adventuring in-game. Regardless, I'm finding it harder and harder to motivate myself to collect. Again, you can only entice people with a carrot on a stick if they can actually see the carrot. Too much hyperbole and "feelings"? Oh well. Can't say I'm in the right mood or mind to argue or convince anyone of anything. So whatever. Agree to disagree and leave it at that. Goodbye 2018. You sucked. Hard. And I really don't have much, if any, hope for 2019. I genuinely feel that it's going to get much worse before it gets better. I don't plan on quitting pet collecting any time soon. Just... I don't know. Blah. Perhaps I'm merely projecting my unhappy RL onto my gaming life. Or maybe it's a reflection of each other. I don't know. All the best to everyone else though. If you have hope and motivation, hang onto that. Keep collecting if you can and if it still brings you pleasure. Something, something... have a safe and happy New Year.